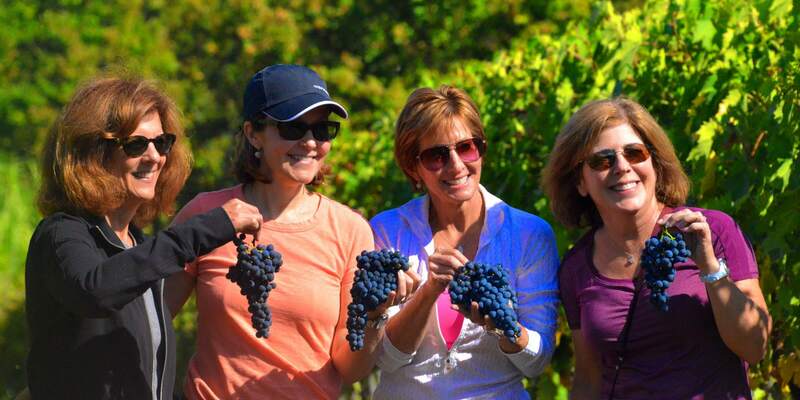 An Incredible Week of Fun, Food, Wine...And it's all in Tuscany! 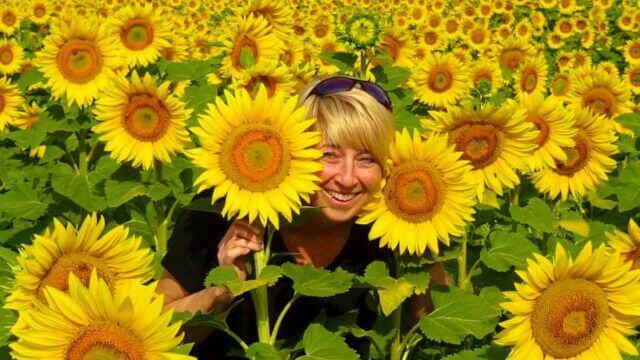 Discover the Heart of Tuscany, Florence, Chianti and Brunello Wines & The Best Local Cuisine! 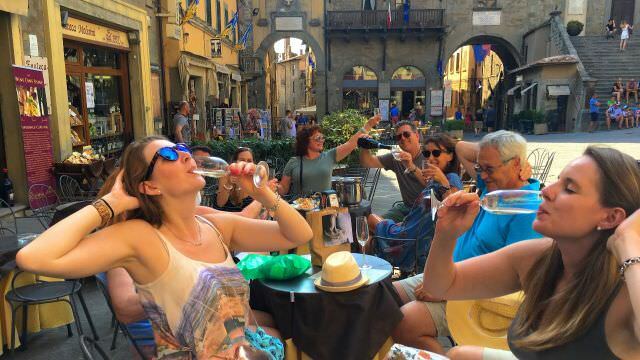 Welcome to our 8-Day, 7-Night all-inclusive vacation based in Chianti, consisting of our traditional, small and intimate groups of no more than 18 guests. This vacation offers a wonderful mixture of some of the highlights of Central and Southern Tuscany. Stroll through the magnificent cities of Florence and Siena, with experiences that relatively few travelers take the time to see. Your vacation also takes you to some off-the-beaten-path treasures strictly unique to the area. This week, you will live amongst the locals in a small Tuscan village, cooking and eating regional culinary cuisine. You will visit several artisans and come to embrace their local traditions in some of the most beautiful locations in Tuscany. You will love being in the relaxing Italian countryside and getting immersed in the local Tuscan lifestyle. And, most of all...It is a week of fun, family and laughter as we share what makes Italy so special in a very personal way. You may recognize it as rustico or country-style Italian, either way, it would be difficult to imagine a world without food from Tuscany. So much of the Italian food we love originated from this region and has made its mark on the culinary world since the times when the Medici Family ruled the land and Leonardo da Vinci and Michelangelo were painting masterpieces. We'll have four classes this week. 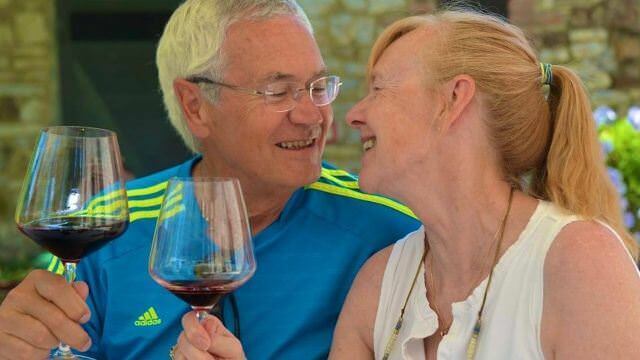 Three are half-day cooking classes along with a wine class and pairing with a certified sommelier to teach us the intricacies of the wines of the region. Locally-sourced - Organic - Farm-to-Table. These phrases would sound redundant to a local Italian, as this is how they've been doing it for centuries. We do our best to adhere to these same traditions, wherever and whenever possible. It's just a better way to do things and the results...Amazing! 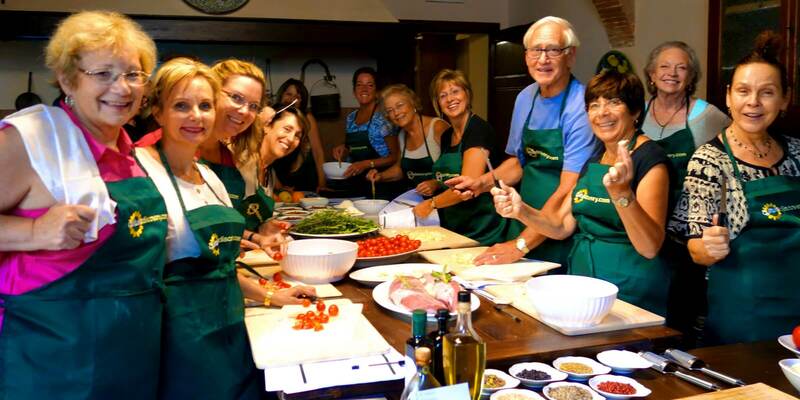 Our cooking classes are not little "learn to make pasta" classes like many others. Instead, the classes are traditional Italian 'Sunday Family Meals'... Multiple courses, all hands-on and done to the max. They are are also not demonstrations. We structure them so that you can be as involved as you wish in every stage of every course we prepare. With every class, we roll up our sleeves and get wrist deep in making everything fresh, from scratch. 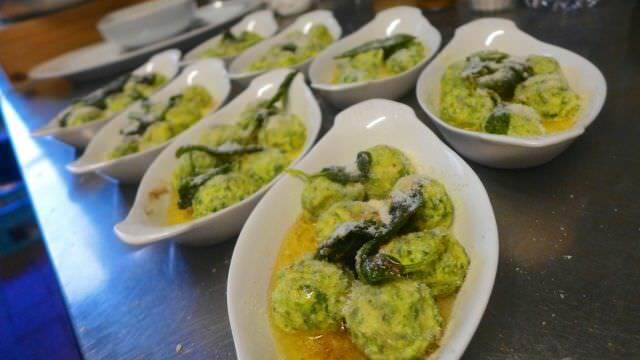 We'll be making these classic local Tuscan specialties. 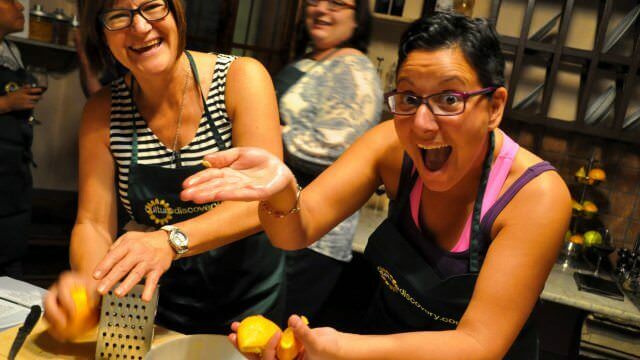 You will learn, every step of the way to make dishes such as; Pici pasta with pesto sauce from scratch, Osso Bucco, Gnudi, Tuscan Lasagna, Eggplant Millefoglie, Schiacciata, Crostata, Cantucci Biscotti, & much more! One of our classes will be with a family that live in a villa on the outskirts of Cortona. 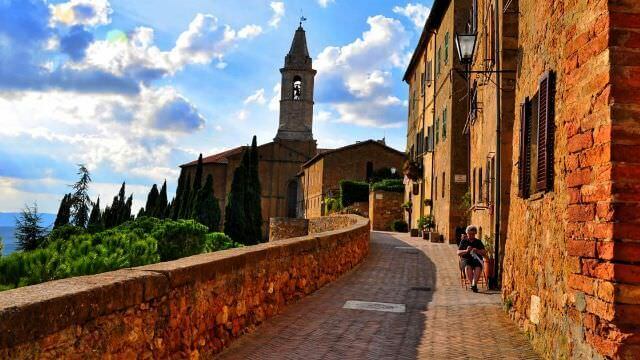 This is the town that was made famous by the book and movie, Under the Tuscan Sun! If you would like to pass on the cooking, go ahead and take a stroll around town, lounge at the hotel, or enjoy the spa services offered there. The choice is yours. Even just opening some bottles of wine will be just fine! After all, it's your vacation - Enjoy it how you like. We'll let you know when lunch or dinner is being served! 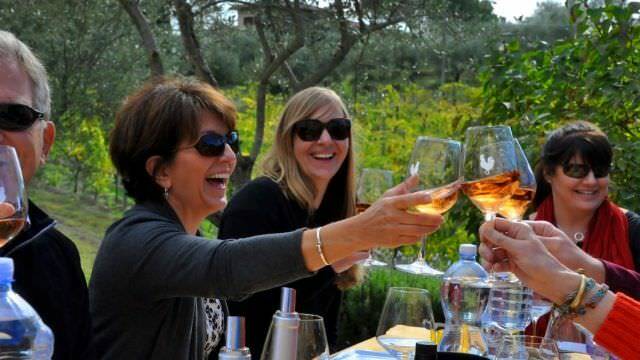 With the Tuscan countryside as our backdrop, a local Sommelier will give us hands-on direction as how to identify the differences of some of the local wines, including Chianti, The Brunello's and the Vino Nobile during our wine tasting course. We have some wonderful outings this week in Central and Southern Tuscany. Among these are several wineries that produce Chianti, Brunello, Vino Nobile, and other Tuscan wines. One such winery is a small family-run producer of one of the last remaining truly artisan wines, made entirely by hand. Another is housed in a 14th century palazzo that is recognized as the most beautiful wine cellar in the world. We have a guided tour of the beautiful city of Siena, including the magnificent Cathedral and the famous Piazza del Campo with its wonderful architecture and scenic cafes. We'll also learn about some of Siena's Contrade, the neighborhoods that compete for the coveted Palio di Siena - The famous and wildly energetic horserace that takes place every July and August in the Piazza del Campo. Imagine experiencing Florence like you live there! In historic Florence, we'll have a fantastic day exploring the city from an insider's perspective. We'll start with a foodie tour heading to the places where the locals go. We'll engage with specialty grocers, bakers, and grab a table at a side-street enoteca. We'll visit the Central Market where the locals shop daily. What's more, we'll be eating and drinking along the way! Since we are in Florence, we'll have to be a little touristy, but we're not going it alone. We'll have our own private guided tour to see Michelangelo's famous sculpture of The David and learn about this and many other historic works of Renaissance art at the Galleria Academia museum. 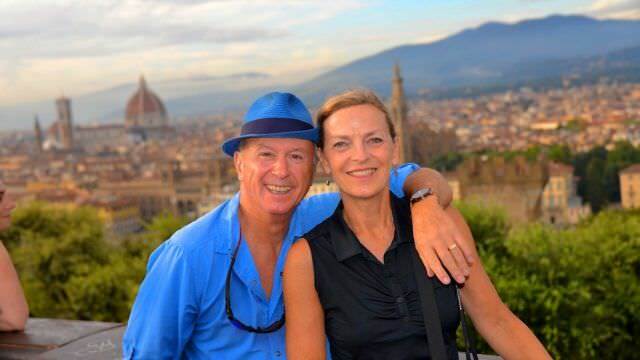 We'll also have the opportunity to mingle with the Florentines, strolling the streets, shopping, having a gelato and taking a picture on the Ponte Vecchio! Even if you are not a big wine enthusiast, not to worry! When we visit the wineries this week, each one of them is selected because it has much more to offer than just the wine. They are truly family experiences, and unique in their own way. One is an architectural phenomenon in the heart of Montepulciano. Another makes Brunello at their family villa nestled in the hills and vineyard of Montalcino. One will be combined with our visit to the cashmere-producing goats. And the other is with a family living in a small hilltop enclave where they also make Tuscan Olive Oil. There are always alternative beverage options and lots of gorgeous scenery to take in. 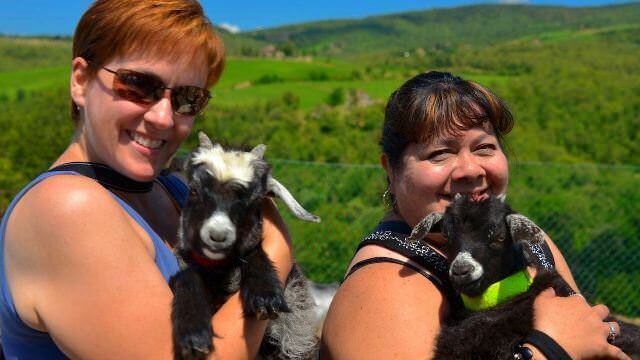 We will visit an artisan cheese producer in Pienza, a Cashmere Goat farm in Chianti, which happens to produce some of the highest quality cashmere you will find. 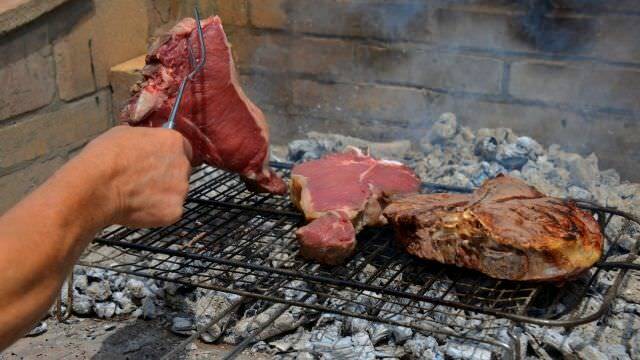 We're invited to a small family run winery and Chianina Beef Ranch (Chianina is the type of cow that is used to make Florentine Steak), and enjoy an afternoon and evening cooking out with the family, and making schiacciatta. This will be a family and friends, Italian-style BBQ, during which we can cook, grill, sing & dance! The restaurants we go to are typically small, local restaurants that are considered to be among the best of the best for their area. These are the places the locals rave about, and are not geared to accommodate mass amounts of tourists. Furthermore, we don't do "special-menu-tourist food". We insist on the highest quality, and as locally-sourced as possible, at all times. When the week is over, you will have lived the real Italy that few tourists have ever even dreamed about, let alone experienced. 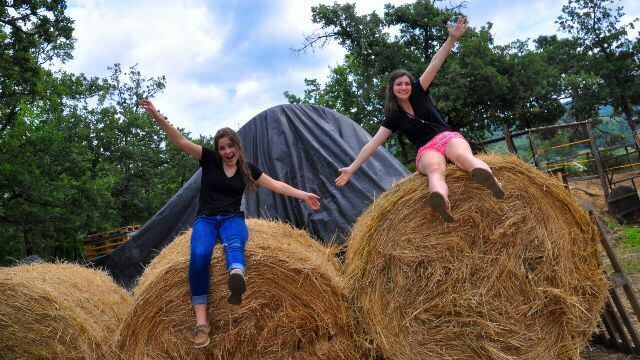 In fact, you will truly be travelers as you will have made new friends, and you will have learned why Italian culture is so amazing... Because you embraced it and lived it...As a local! Our home base this week is Radda in Chianti. This area was the original Chianti wine-making zone of Tuscany. You know these wines as the Chianti Classico which you may recognize by their labels that bear the famous Black Rooster logo. These wines are held to a higher standard and must adhere to strict guidelines during the wine-making process. We'll visit two Chianti Classico wineries this week. One is Vigna Vecchia, the other is in Castellinuzza e Piuca. 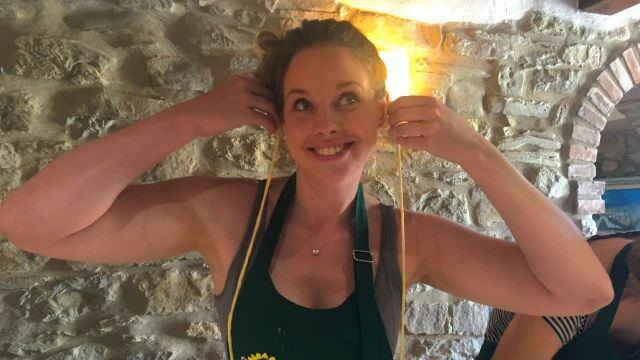 We'll have an amazing time at this family-run winery where we'll be making Tuscan pizza bread, Bistecca Fiorentina and having ourselves a little party with our friends in this hilltop hamlet. Our farewell dinner will be at the restaurant of the L'Ultimo Mulino Resort Hotel in nearby Gaiole in Chianti. We will be guests of the owner of this completely renovated building that was once a centuries-old water-mill. 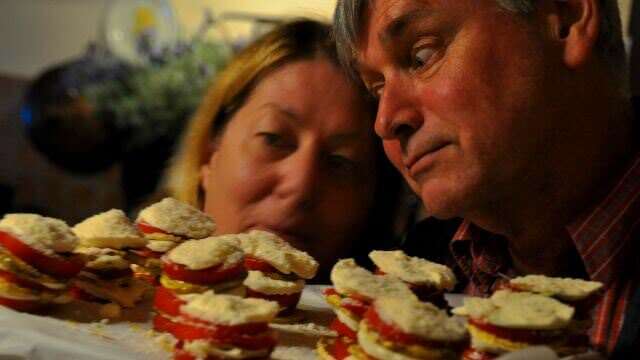 In Southern Tuscany, we'll have one of our cooking classes at a private villa on the outskirts of Cortona. No trip to Tuscany would be complete without a stop in its two major cities. One being, Siena. Medieval meets Renaissance in this beautiful city that once rivaled Florence for Tuscan supremacy. Siena ultimately lost that battle to the wealthy Medici Family and the strength of their Florentine armies. 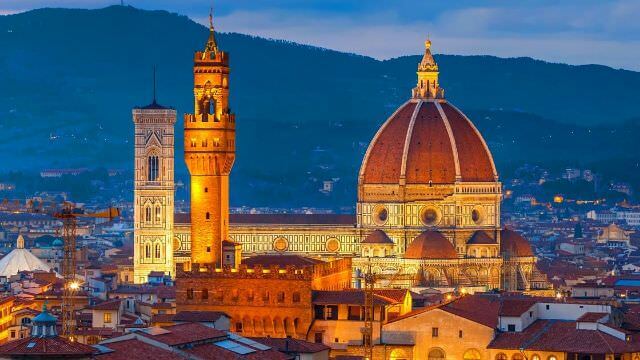 Florence, there is a reason why it has become one of the most visited cities in all the world. It's no wonder as it houses some of the most incredible art and architecture to be found anywhere. We visit both these magnificent cities in such a unique and personal way, that it will leave you with an indelible memory of your time here. Two of the most recognized wines from Tuscany are Vino Nobile and Brunello. The most typical type of cheese in Tuscany is Pecorino. 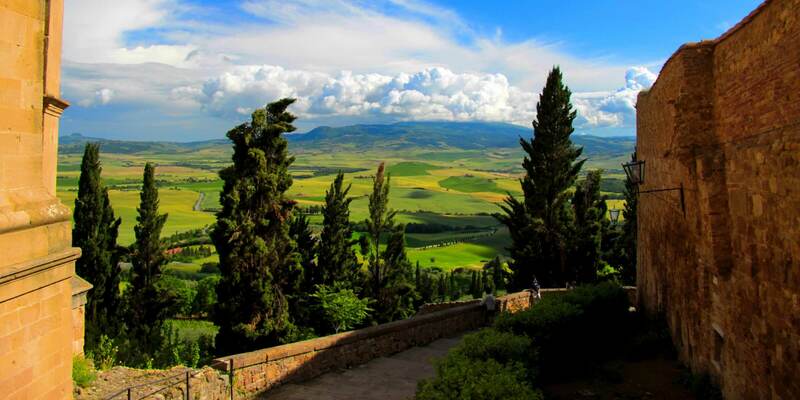 We bring it all together with memorable visits to Montepulciano, The Montalcino Countryside and Pienza. We'll have a family-winery experience with lunch in the vineyards at the home of our friends that make artisan and organic Brunello wines. 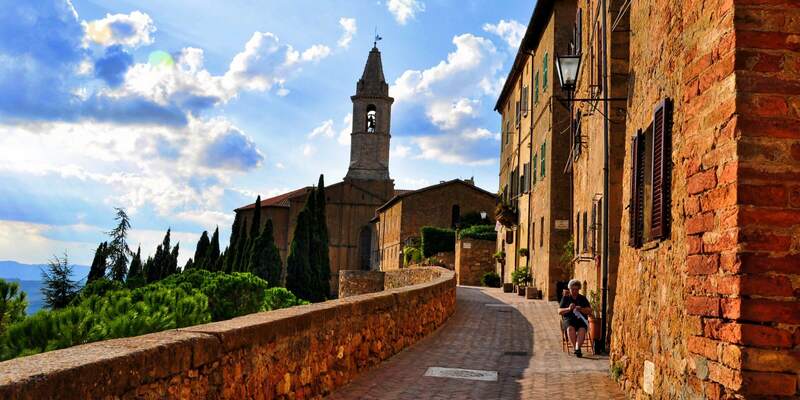 On our way to Montepulciano we'll make a stop to sample different styles and ages of Pecorino cheese in the magnificently restored and picturesque town of Pienza. Ultimately, we'll have a personal visit, wine-tasting and pairing with the family of the centuries-old wine cellar of Cantina de' Ricci. 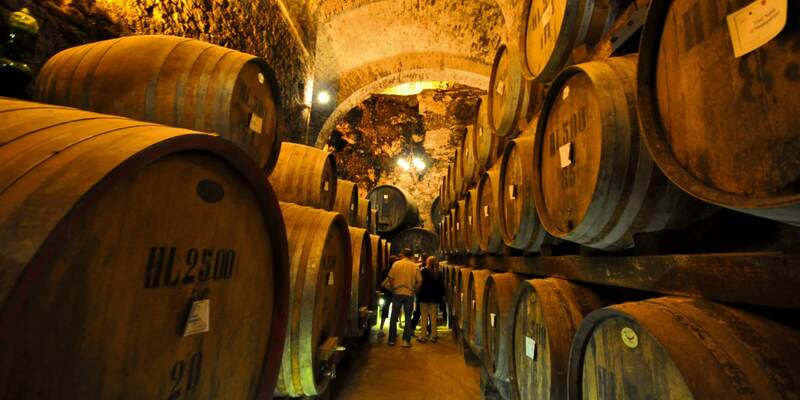 It is considered to be one of the most beautiful cellars in the world. Be prepared for an incredible day of some fantastic wines. Grab an apron! We're cooking some amazing Tuscan recipes! At our hotel later this afternoon, we'll learn the nuances and intricacies of Tuscan wines with a certified Sommelier at our own private tasting and pairing. We'll be making some regional and seasonal dishes with locally-sourced ingredients. Many of which are grown in the villa's gardens. This will be a special evening with friends and family in a beautiful setting amongst the Tuscan vineyards and olive orchards. 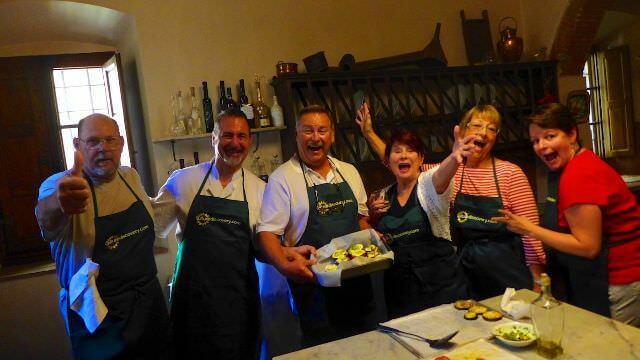 For our third cooking experience, we'll be up in the hills and vineyards near Greve in Chianti for a BBQ - Italian Style! Our friend, Simone and his wonderful family at the Castellinuzza Winery will be hosting us tonight at their villa and farm. We'll serve up some antipasto and assorted salumi while we're making Schiacciata, A Tuscan Pizza Bread, and Grilling Bistecca Fiorentina to perfection. Of course, this will be accompanied with a lot of fantastic wines from their cellars! At today's class, our chef will be sharing some of her favorite family dishes with us. Since we have become family by now, it's only fitting that we learn to make the chef's wonderful family recipes from generations past.